LG today introduced the X Charge, a new smartphone that will be available on Xfinity Mobile - the MVNO (mobile virtual network operator) unveiled earlier this year by cable giant Comcast. The LG X Charge appears to be a rebranded X Power 2 - a handset released by LG last month in various markets around the world. The new phone's highlight feature is its very generous 4500 mAh battery that should, according to LG, be capable of keeping the lights on for a whole weekend on a single charge. 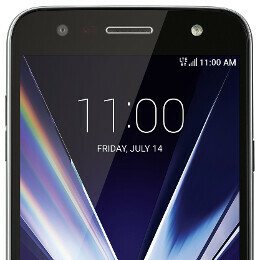 Running Android 7.0 Nougat, Xfinity's LG X Charge sports a 5.5-inch 720p display, and is powered by a quad-core Qualcomm Snapdragon 425 processor. The handset also offers 2 GB of RAM, 16 GB of expandable storage space, a 13 MP rear camera, and a 5 MP front-facing camera (both with LED flashes). The LG X Charge will be available from Xfinity Mobile starting tomorrow, June 30, online, via call centers, and in stores. LG didn't say how much the phone will cost, but its price should be around $200 (if not less). Using Verizon's 4G LTE network, Xfinity Mobile also provides "access to millions of Xfinity Wi-Fi hotspots so you can save money," while offering unlimited monthly data plans starting at $45 per month. You can find out more about the network at the second source link below.